I recently attended the Fall Conference at the Federal Reserve Bank of St. Louis. It was am excellent conference, with some of the world's most prominent macroeconomists presenting papers - Mike Woodford, Larry Christiano, Martin Eichenbaum, and Nancy Stokey (who was quite amused when I told her she was "one of the founders of behavioral finance"), among others. Bob Lucas, father of modern macro was in attendance, as were fellow bloggers Mark Thoma, David Andolfatto, and Steve Williamson. It was also great to meet the St. Louis Fed's charismatic leader, Jim Bullard. A lot of interesting papers were presented, but my favorite talk was by Martin Eichenbaum, who is by far the most fun econ seminar speaker I've ever seen. Along with his frequent co-author Christiano, Eichenbaum has taken on the task of making the gigantic "kitchen-sink" macro model that (hopefully) incorporates all of the various "frictions" and "shocks" that the macro community has decided are important for explaining business cycles. Whereas most macro models focus only on one or two features of the economy, Christiano and Eichenbaum and their various co-authors lump them all into one. In 2005, they came out with the Christiano-Eichenbaum-Evans model, which was the basis for the later Smets-Wouters model that has become the standard at central banks. Now they are offering a new and improved version, the Christiano-Eichenbaum-Trabandt model. This model relies much less on price stickiness to produce business cycles, and more on the labor-search models that have become popular since they won the Nobel Prize in 2010. But during his talk, Eichenbaum said something that really caught my attention: "Maybe next time [we update our model], we can finally get rid of the...Euler Equation." Basically, it says that how much you decide to consume today vs. tomorrow is determined by the interest rate (which is how much you get paid to put off your consumption til tomorrow), the time preference rate (which is how impatient you are) and your expected marginal utility of consumption (which is your desire to consume in the first place). When the equation appears in a macro model, "you" typically means "the entire economy". This equation underlies every DSGE model you'll ever see, and drives much of modern macro's idea of how the economy works. So why is Eichenbaum, one of the deans of modern macro, pooh-poohing it? Simple: Because it doesn't fit the data. The thing is, we can measure people's consumption, and we can measure interest rates. If we make an assumption about people's preferences, we can just go see if the Euler Equation is right or not! When I caught up with him later, Eichenbaum was kind enough to refer me to the literature that tries to compare the Euler Equation to the data. The classic paper is Hansen and Singleton (1982), which found little support for the equation. But Eichenbaum also pointed me to this 2006 paper by Canzoneri, Cumby, and Diba of Georgetown (published version here), which provides simpler but more damning evidence against the Euler Equation. In other words, the Euler Equation says that if interest rates are high, you put off consumption more. That makes sense, right? Money markets basically pay you not to consume today. The more they pay you, the more you should keep your money in the money market and wait to consume until tomorrow. But what Canzoneri et al. show is that this is not how people behave. The times when interest rates are high are times when people tend to be consuming more, not less. OK, but what about that little assumption that we know people's preferences? What if we've simply put the wrong utility function into the Euler Equation? Could this explain why people consume more during times when interest rates are high? The negative correlation is harder to see in that picture, but it's still there. Canzoneri et al. experiment with other types of preferences, including the other most popular alternative, Epstein-Zin preferences, and they find that the negative correlation never goes away. No matter what we assume that people want, their behavior is not consistent with the Euler Equation. Maybe if we kept trying different utility functions, we'd eventually find one that was less glaringly contradicted by the data...but as my macro teacher Chris House once told me, that is sort of an iffy thing to do. Maybe it's just the case that the economy doesn't make consumption decisions the way the Euler Equation says it does, and no funky preferences will fix the problem. So anyway, what should we take away from this paper? Two things, I think. 1. If this paper is right - and one paper is not enough to be conclusive - then essentially all modern DSGE-type macro models currently in use are suspect. The consumption Euler Equation is an important part of nearly any such model, and if it's just wrong, it's hard to see how those models will work. If you have misspecified microfoundations, especially big stuff like this, it's going to make your model come out wrong. So more people need to be doing research to figure out if Euler Equations are, in fact, FUBAR. 2. I've often thought that macroeconomists should be more careful about checking their "intermediate results". In other words, macro theorists tend to make a bunch of assumptions, throw a bunch of equations into a model, see what comes out at the end, and then (loosely) compare those final results to the data. But usually, those equations lead to smaller-scale "intermediate results" that can be tested directly. This Euler Equation is an example. I say, test the parts, not just the whole. Why not? I have to say that I was really, really impressed by Eichenbaum criticizing the Euler Equation (which he uses in his models) and referring me to a paper that specifically rebuts his most famous paper. First of all, it means he's willing to engage with critics, which is great. But even more importantly, it showed the kind of respect for the data that I've rarely seen in the macro field. Eichenbaum uses Euler Equations in his models because they're the only game in town, but he hopes to replace them someday, because they just don't seem to fit the facts. Eichenbaum really made me feel a lot better about the macroeconomics field; there really are macro people out there who aren't resigned to the defeatist idea that "all models are wrong"! It's important to realize that there are other things that the authors don't consider that might work against the paper's result. Patrick Kehoe and Andrew Atkeson claim to have one here. Like I said, one paper is not enough; we need a whole literature of papers analyzing whether the Euler Equation is usable or not. Like Shiller's "excess volatility" result, it's going to take time before the weight of evidence piles up. Here is another (great) paper attacking the Euler Equation, which I had never seen. This paper basically finds that the equations are impossible to estimate. That casts a lot of doubt on the literature that is dedicated to estimating them. Do those Euler equations incorporate wealth and debt? Two people with income X, but different levels of wealth (and/or debt), are their MPCs different? Do income and wealth MPCs interact? Can there be two heterogenous people in this models? Or just one representative agent? In principle the model has lots of people. In practice to actually be able to solve and estimate the model they have to turn all of the differences between people off --- at least in the consumption dimension (in Christiano, Eichenbaum & Evans they allow some differences between people in hours worked, but this is the only dimension). Wealth and debt would enter through the intertemporal budget constraint. To get that explicitly you'd have to solve the (difference equation) Euler which is a pain if the interest rate isn't constant. I made my largest consumption decision (buying a house) at a time of highish interest rates because I expected future inflation and rents were tied to the interest rates that landlords had to pay. For people saving now for retirement, a fall in interest rates may lead to lower consumption now as they try to save enough to live on in a low interest rate environment. You really need a model where some people are planning their consumption out twenty to forty years and trying to put a floor under a worst case outcome. This is just another way of saying that risk premiums are highly unstable over time. People do not believe the economy will quickly return to equilibrium. The equilibrium assumption is the real problem. The equilibrium assumption, which is blatantly wrong, is indeed the deepest problem. Nobody believes in equilibrium. Everybody's expecting change around the corner... though people have wildly different predictions. Well, I just quickly skimmed the paper but I don't really understand how they tested Campbell/Mankiw's finding. Why would only the consumption of the optimizers affect the interest rate? Also personally, I think consumption smoothing assumptions are pretty weird, at least on the borrowing side. No one I know would borrow against future income (w/ the notable exceptions of student loans and mortgage) because most people are too risk-averse to assume their income is going to follow some certain trajectory. Much more than consumption affects the interest rate. What the authors show is that the pattern of consumption we actually see would need a counterfactual interest rate in order to be justified under the Euler Equation. Does that make sense? Perhaps the rate at which people adjust their expectations about future consumption also increases - i.e. their "error correction" ramps up over time as extra growth and income comes down the pipeline, like 2003-2007 for example, and even when the extra growth and income disappears, it takes a break in the system to dampen down those expectations. Since higher interest rates are most likely to occur when growth and income have ramped up for a number of years, this might lead to a "negative" co-efficient for the interest rate effect. In essence people over extrapolating, and increasingly so over time. 1) I'm not convinced the empirics are inconsistent with an Euler equation. Were they able to rule out reverse causality: we'd still observe the correlation between consumption and interest rates they observe even if it is true that higher interest rates cause people to reduce consumption if the interest rate is largely being caused by shocks to preferences. We know that the Fed reacts to information about the economy, so it's not clear to me how they could find the exogenous variation in interest rates needed to make any conclusions. 2) I don't think the problem is the Euler equation per se, but rather the linear and non-linear approximation techniques we use to solve these models, which necessarily ignore potentially important uncertainty-driven phenomena. we'd still observe the correlation between consumption and interest rates they observe even if it is true that higher interest rates cause people to reduce consumption if the interest rate is largely being caused by shocks to preferences. We know that the Fed reacts to information about the economy, so it's not clear to me how they could find the exogenous variation in interest rates needed to make any conclusions. Sorry, but this is not right. The Euler equation is says nothing about causality in the first place. It just says A=B. But in fact, A!=B. I'm not sure I understand then. An increase in the discount rate would cause both a rise in the interest rate and contemporaneous consumption, no? Oh no, that's right, big swings in discount rates could be driving the whole system, under some added unrealistic conditions.. Remember, if we make up crazy preferences we can solve anything. I don't think this is "crazy". It sounds very Keynesian to me ("animal spirits" and all that)! 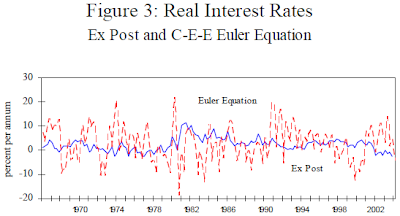 and in the computation of the Euler equation interest rates"
when I read that it sounds like they are ignoring the non-optimizing half of the population. But then again I also didn't see an explanation for what dt is so I'm sure I'm just missing something obvious. Oh, of course they are. That's kind of the point! Euler Equation assumes everyone and their doge optimizes. well, if Campbell/Mankiw are right, then maybe the Euler Eqn is only half wrong! Almost everyone optimizes - they just all have different forecasts, discount rates, risk aversions, risk assessments, and utility functions. Just because someone has a high discount rate does not mean they are not optimizing some utility function. You're right that Campbell/Mankiw throws a big wrench into most macro models. Why am I not surprised that people don't really make consumption decisions based on prevailing interest rates (which the vast majority don't understand and probably do not have meaningful confidence in their ability to forecast). It seems to me (an amateur and novice at best), that it should not be particularly surprising that consumption - a driver of strong growth - would correlate with higher interest rates - an indicator that there has been strong growth (relative to levels that would not create inflation concerns and thus higher rates). But I cant' tell if Scott Sumner would yell at me for that last paragraph or agree. Congratulations on an excellent and informative post, Noah. I had not known of this problem, although I cannot say I am super surprised. A way of looking at this is to say that what is driving things is in fact much shorter term relationships of the sort that the paleo-NKs mumble about, perhaps with some specific lag formulations. So, sure, if the Fed pushes short term interest rates up, we expect there to be a slowdown in economic activity, particularly if those are to higher than normal levels from some "normal" level, whatever that might be, and vice versa. OTOH, rising economic activity, associated with rising consumption, tends to push interest rates upwards, which is probably what most more naive observers who do not know about intertemporal optimization (and think it is the duck's meow) would say, e.g. economic journalists. Heck, I was watching Kudlow last night, and he was forecasting rising interest rates due to rising economic growth, although we could say that this may be the Fed thinking in Phillips Curve terms as well. Just as a historical note I would suggest that the testing of the consumption Euler eqn dates back to Robert Hall's (1978) consumption as a random walk hypothesis (derived from a consumption Euler eqn after making some simplifying assumptions). Hall, Robert (1978). "Stochastic Implications of the Life Cycle-Permanent Income Hypothesis: Theory and Evidence"
Or look some of the papers by Chris Carroll on the buffer stock/precautionary saving model. Once you aggregate over the Euler equations of many households with incomplete insurance against personal income or business risk, you can under some conditions derive an aggregate Euler equation with the addition of what looks like a preference shock. Times when the preference shock tells you to consume less now (because of higher uncertainty about the future, higher job loss risk for example) are typically recessions when interest rates tend to be low. That's what underlies the many simulations of Keynesian recessions using consumption preference shocks. Similarly if you have a model with credit constraints, your aggregate Euler equation needs to be modified to allow for the shadow cost of the constraint or a spread on external financing (simplest to see this in models with 2 types of households borrowers and savers, like those by Iacoviello- those models are quite popular now in policy work). Again times when external financing is more costly so households tend to postpone consumption are times when interest rates tend to be low in recessions. The point is the correlation is negative because there are other consumption shifters in the equation and make it difficult to identify the sensitivity of household borrowing/saving to interest rates using instrumental variables or its GMM generalisation..
That's not a defeatist idea. It doesn't say that one model can't be better than another. The idea is that any economic model that is useful is necessarily wrong, as to be useful it needs to be sufficiently simple. Take any economic model, and it can be rejected if you have enough data. But we can always find better models. We're not defeated, but we're never going to attain bliss. To add to that: I know you would like this to be simple. It would be nice if we could apply litmus tests to economic models - throw out the "bad" ones, and keep the "good" ones. We don't do that explicitly, but as a profession we're always engaged in that process. Some papers are accepted for publication; some are rejected. Some people get good jobs; some get bad jobs. Policymakers take some advice and ignore other stuff. ...Billions of flies can't all be wrong. Pro tip: Regardless of what you and your colleagues tell yourselves, at the end of the day what you do is still grotesquely pre-scientific, and painfully so. You, sir, are in dire need of some training in economics. It actually gets better than that. You can easily show that for many models in finance the wrong models (with the explicitly wrong assumptions) outperform the true models (with exactly right assumptions). It's all a function of how small your samples are and how hard it is to filter the noise away. Complex models with lots of structure overfit data sets generated from the very models! Simpler but wildly wrong models are less susceptible to noise and vastly outperform the trues ones. Beware of realistic models. The noise is waiting for you. "Some papers are accepted for publication; some are rejected. Some people get good jobs; some get bad jobs." If you consider peer review and job market performance as scientific benchmark iit is hardly surprising that you get virtually everything wrong. The idea sounds good, but the paper you discussed seems a bit weird - if I understand correctly, authors don't estimate preference parameters, they just plug in some specific numbers for risk aversion, etc. They also estimate forecasts of consumption growth and inflation, for which they use VAR, but they provide little detail. I wonder if the discrepancy was lower if they used different preference parameters, or more complicated forecasting model (time-varying volatility?). As for studying Euler equations, that's what much of asset pricing is about, solving equity premium puzzle and all that, no? authors don't estimate preference parameters, they just plug in some specific numbers for risk aversion, etc. That shouldn't affect the sign of the correlation. I'm sure their result doesn't depend on parameters, they can easily just rerun it sticking different parameter values in, it would be a pretty big FAIL if they did not do that robustness check. They also estimate forecasts of consumption growth and inflation, for which they use VAR, but they provide little detail. True, I'd like to see more detail about the methodology. Just read the paper. They assume the IES is 2. Plug in -2 and you'd probably get a pretty much perfect fit. 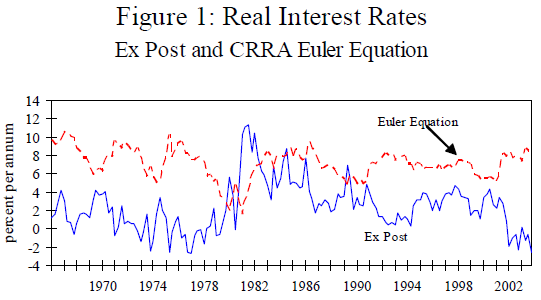 "In other words, the Euler Equation says that if interest rates are high, you put off consumption more. That makes sense, right? Money markets basically pay you not to consume today. The more they pay you, the more you should keep your money in the money market and wait to consume until tomorrow. But what Canzoneri et al. show is that this is not how people behave. The times when interest rates are high are times when people tend to be consuming more, not less." Seriously Noah, you must have heard of income and substitution effects? What you describe just means that the income effect dominates the substitution effect. It does not in any way mean that the Euler equation does not hold. Short term rates are set by the Fed. Long term rates are guesses about the Fed's chosen path of short rates. Fed lowers rates in recessions (and they do it faster than inflation drops) when consumption falters so low consumption coincides with low rates. Does the Fed set real rates, or just nominal rates? It sets nominal rates, but in the period 1992-2008, the Fed was able to maintain a broadly stable CPI inflation while moving the policy rate according to macro conditions (higher when the economy was strong, lower when it was weak). So, de facto, the Fed set real rate in that period, which is nearly 30% of the sample period in the graphs you posted. Can't this be one of the reason for the negative correlation? I haven't read the paper so can't comment on it. but the claim that the consumption Euler equation has serious problems is hardly new. I recall Olivier Blanchard criticizing two of the three eqs (cons Euler eqn and NKPC) in canonical NK models as 'patently false'. Quadratic utility would work... better. Dang it, it seems Anonymous above beat me to it. 1. Why is it called the Euler equation? Euler was one of the greatest mathematicians, and last I checked, he didn't do macroeconomics. 2. What is the notation E_1, u' and delta? 3. Why not assume the Euler equation, and then work out what utility function is required to fit the data? If the resulting utility function is a jagged mess or violates the axioms of a utility function, then you can throw it out. 1. the equation can be formally derived as discrete-time analogue of Euler equation in calculus of variations. 2. conditional (on period 1 info) expectation, derivative of utility function, discount rate. 3. not a bad idea, but I guess one problem is that nonparametric methods require lot of data to get any reasonable estimate. In any case, it's not the Euler-ness of the equation that's being questioned, which would be a purely technical issue, but the substance if the equation itself. 3. Because if you are free to choose an arbitrary functional form for utility, then you are certain to be able to fit any finite dataset exactly. Therefore no dataset could provide support for the hypothesis that the equation is valid. It is necessary to place plausible constraints on the utility function first. So if r is higher less consumption (ceterus parabus of course) - but the evidence contradicts this. the observation that consumption data are inconsistent with the basic PIH model (which has the same Euler eq, I think?) was part of second year undergrad macro at my uni. Isn't it everywhere? when it comes to replacing the Euler equation, do you have in mind macro models that are driven by something other than inter temporal optimization (and if so, what? ), or do you still expect to see inter temporal optimization at the heart of things, but maybe with OLG and heterogeneous agents, wealth & debt, non-rational expectations etc. so the aggregate relationships you end up with look quite different? DSGE models have so many massively wrong assumptions in them, why pick on the poor little Euler equation? Hmm, a quick idea: interest rates correlate with inflation rates. Inflation is created when the wealth distribution shifts in favor to the middle and lower classes. More wealth means they consume more. Heh, I didn't really read thoroughly enough to catch the word "real", but then I also think that the majority of economically untrained people neglect the difference between nominal and real values. And I think that there's a very strong anti-deflationary bias in the public and private financial sectors. And each increase in inflation is countered by an even stronger increase in interest rates. Good post. Thanks for doing posts like this. They are useful for people like me. Suppose you had a New Keynesian model in which the only shock was shocks to d (rate of time preference proper), and the central bank was doing its best to respond to those shocks. Wouldn't we see exactly this negative correlation? Exactly my thought. Similarly, if people are losing jobs and therefore spending less, the central bank reduces interest rates. Assuming the job effect is larger than the interest rate effect, there would be a negative correlation. (Which would suggest that the goal to remove the Euler equation is still the right goal). I was about to make this comment and thought I might as well read through a few and see if someone else mentioned it. Essentially I was going to say there might well be a correlation but it might lag and be causal in both directions. That is banks set interest rates when they see more consumption (because they can/ the fed is trying to limit inflation) and consumers might consume less but with a lag when interest rates start to bite. Thought you would like this. Causality in reverse. "But what Canzoneri et al. show is that this is not how people behave. The times when interest rates are high are times when people tend to be consuming more, not less." The supply-side tax cuts reduced saving? Monetary policy does not work? Malthus was right and Ricardo wrong about overproduction? As an outsider looking in on economics, I'm not sure if my interpretation of this post is right, that Canzoneri, etc. are overturning much of modern economics? Help! Funny that if you apply your own criteria for falsification then your utility maximising stuff falls apart too. Funny that indeed. Anyway, let's just be polite and ignore that, shall we? Great post - asks a question about a key failing of theory. Kudos for having the courage. I do not subscribe to saying this is "deep structural" and not visible in the data OR just a hard problem to isolate the effect etc. If it does not agree with data, it is suspect. Period. Being a private sector researcher, I have gotten around the problem of complexity in aggregate data by breaking down consumption into logical parts. 1) Housing consumption definitely responds to interest rates. However it is hard to say whether it would without fiscal policy - subsidized interest payments, GSE lending. If it were upto private sector origination, would anyone lend at 4% 30 year fixed? 2) Other household consumption depends on real wage growth, jobs etc. No effect from interest rates. Has Bernanke checked getting an unsecured loan from his bank for spending? How does that interest rate spur his spending? Wealth effect is small, btw. 3) Non-fin corporations invest/consume when there is demand growth AND they have no spare capacity. Again, wealth effect is there but small. 4) What about the people who have savings? Does not a rate cut hurt their consumption? I could go on. But after spending a lot of time on it, I have junked this notion. Does the equation have the cause & effect the wrong way around? Interest rates are high because people are consuming more, and they are low when people are consuming less; rather than people consuming based on an interest rate? Or maybe this doesn't matter. Pardon my laziness for not wanting to spend the time sorting through Canzoneri et al's equations, but what is the metric being used to measure the consumption trend over time here? The trend in nominal consumption spending? Real consumption spending? Nominal consumption spending as a % of total spending? The latter would seem to me to make the most sense as higher interest rates all else equal should theoretically encourage more investment relative to consumption (ummm, or is it, greater demand for investment relative to consumption all else equal should theoretically equate to higher rates? I dunno). If Canzoneri et al are just looking at the trend in consumption spending, then all they're seeing is the obvious that interest rates are higher when growth is faster. Couldn't that negative correlation just be the policy response? If there is a large exogenous shock to consumption, central banks slash interest rates. That gives you a relationship where high consumption correlates with high interest rates. But doesn't this make perfect sense? The issue is that high real interest rates is not a ceteris paribus phenomenon; its exogenous with high expectations of future growth. High expectations of future growth mean people will actually be incented to save less since they will expect their incomes will be higher in the future, as well as that their current stock of savings will gain high returns, meaning that their flow of savings versus consumption should reasonably be lower. Think about it this way - if you're confident that the next ten harvests are going to be awesome, how much grain are you stowing away? Also, couldn't causality be reversed? If the flow of savings is dwindling and consumption increasing, wouldn't supply and demand lead to borrowings being willer to offer a higher price - ie interest rate - to savers for the limited amount of savings to be invested? "its exogenous with high expectations of future growth." It's been a long week, man. I'm not an idiot. Really. Is there much Monte Carlo modelling in macro at the moment? It would seem to me that we have enough computing power to model each actors behavior in the economy and let the model go to do some predicting. It doesn't have to be at the individual level to be useful - maybe classes of people: profession, age, income broken up geographically etc. Monte Carlo modelling gets really really hard if you have a situation, like, say, the macroeconomy, where you have millions of individual actors whose choices depend in part on the choices made concurrently by all those other actors. Yes, there is plenty of this stuff going on, just look at Anthony Smith at Yale or Victor Rios-Rull at Minnesota. The fact that Noah, and the rest of the nitwit commenters on this blog, don't know what is actually going on in macroeconomics is an indictment of them, not us. I think that fluctuations in the rate of technical growth can also explain why consumption and interest rates move together rather than in opposite directions. The interest rate the EE would predict depends critically on the intertemporal elasticity of substitution. Essentially you can generate every kind of correlation between the observed and predicted parameter with different values for that elasticity. I only had a quick glimpse at the paper, but what they seem to be doing is just assume that this elasticity takes the value 2, and then the EE does not fit. But that doesn't mean that the equation is wrong but just their parameter. My two cents: Could it be that the interest rate and the time preference both measure the same thing, namely the difference between the marginal utility of consumption today and that of future consumption? Accordingly, current consumption may be correlated to the difference between those two measures rather than the absolute value of interest rates. If interest rates are higher than time preference, consumption will decline. If interest rates are lower than time preference, consumption will increase. Also, interest rates may be a lagging measure since they are determined in the market for borrowing and savings and also are heavily influenced by the Fed. On the other hand, people have a real-time sense of whether they will be poorer or richer in the future, which ultimately determines their time preference. Basically, interest rates always play catch-up to the time preference. Furthermore, in periods such as the last 4 years, when people expect to be poorer in the future, meaning they have a negative time preference (in plain English, future consumption has higher marginal utility than current consumption), interest rates can never quite catch up because of the lower zero bound. In effect, you have sustained conditions of depressed consumption and interest rates new zero. "Could it be that the interest rate and the time preference both measure the same thing"
Yup. One's a preference; the other's a price. Find where the slopes are the same, and there's your solution. So Euler equations don't fit facts for fundamental reasons, the models based on them don't work so people don't use them outside of economics departments, but professors go on working on the models because they can't think of anything better? Wow. I think economics could explain that, if they tried. Also used for asset pricing, and that has worked so well in finance. Yes indeed, a professor could make a good income from that work. Dumb question: is the Euler Equation the same as the Euler-Lagrange equation from mechanics? You know the first order condition for a path to be make the action integral an extremum? Isn't it all a bit circular? 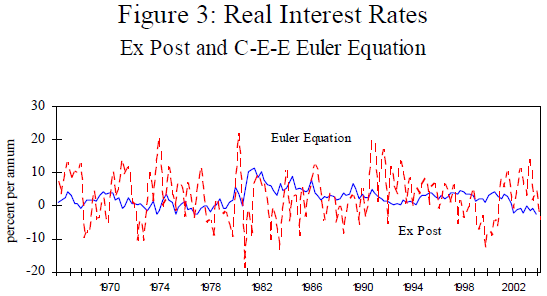 Not the Euler equation, obviously, but the relationship between interest rates, saving and consumption? I was going to make a dumb remark about inflation, but r is the real interest rate, obvs. Also, an observation about safe assets, since r is assumed to be the rate of interest on safe assets. The interest rate on safe assets tends to fall in recessions as people move out of risky assets into safe ones. Consumption also tends to fall in recessions because people have less money, duh. And vice versa also applies for both. Is there even correlation, let alone causation? You tell me. Okay, I haven't read the paper, or thought about this a whole lot, but here's my off-the-cuff guess. I think it's critical to take into account the factor or factors that cause interest rates to change. When a shock affects interest rates, that shock simultaneously affects expectations for growth, which causes a complete shift in the consumption path. The Euler equation describes the ongoing expected rate of change in consumption, but it doesn't capture the shift. And the shift probably goes in the opposite direction of the interest rate change. Think of it in terms of asset values: if interest rates fall, assets like gold go up in price, but their expected rate of change going forward declines. So gold prices go up when interest rates fall, even though Hotelling's Euler equation says nonrenewable resource prices go up at the rate of interest, and thus imply smaller price increases when interest rates are smaller. There's a good chance I'm wrong about this, but given the clear negative correlation, I'm wondering if this is just a conceptual mistake. Moll already has the solution for the comovement. I think you should look into ABM (Agent Base Models) with heuristic decisions. Much of whats observed here could simply be that people use simple heuristic of looking at their bank account and when there is too much money in the account people transfer more money into a savings account. If that is true then the results will differ when real interest rate r is low or high for a long enough time. In other words, the euler equation might still hold if you use a rolling year average instead of a yearly average in the equation. How about trying a wealth-effect model then? If interest rates are high, people figure they'll have more money later (thanks to the interest), so they spend more now. This fits the data. So use this as the basis of a macro model. See what you get. Noah, this is serious advice; if you get a decent model which makes good predictions out of it, you could become permanently famous. Oho. I've got another idea. Suppose there's reversed causality? When people are consuming more, they are more desparate to get money. They borrow that money. Therefore the banks can chargr higher interest rates. So interest rates rise when people consume more. This makes the (correct) assumption that most of the population is in debt, and that (as the MMTers have shown) loans precede deposits.